A well presented extended three bedroom detached character home, situated on a wide garden plot in the heart of the village. The property features a welcoming reception/dining hall, spacious triple aspect sitting room with open fireplace and aspects over the garden, family room/snug with open fireplace, fitted kitchen and conservatory. On the first floor there is a master bedroom suite with en-suite shower room, two further double bedrooms and a family bathroom. Outside there is a plenty of off road parking leading to an impressive newly built detached double garage with loft storage room and gardens extend to the front, side and rear of the property, with the rear boundary backing onto farmland with a bright westerly aspect. From our office turn left into the High Street and first right into Knowle Lane. After approximately two miles turn right into Wildwood Lane. At the junction with the A281 turn left and continue to the Alfold Crossways. Turn right signposted Alfold and Loxwood and immediately left and continue to Loxwood Village. On entering the village, Rogues Roost will be found on the right hand side, just after the turning to Pond Copse Lane. Loxwood is a sought-after village lying close to the Surrey/Sussex border, with local butcher and delicatessen, hairdressers and village store with post office. In addition there is a fine parish church and primary school. The larger village of Cranleigh is approximately 6 miles to the north with a good range of shopping including M&S Food and Sainsburys, a choice of state and private schooling and a leisure centre. Billingshurst is approximately 6 miles to the south with mainline station to Victoria and also offering a good range of shopping, educational and sporting facilities. 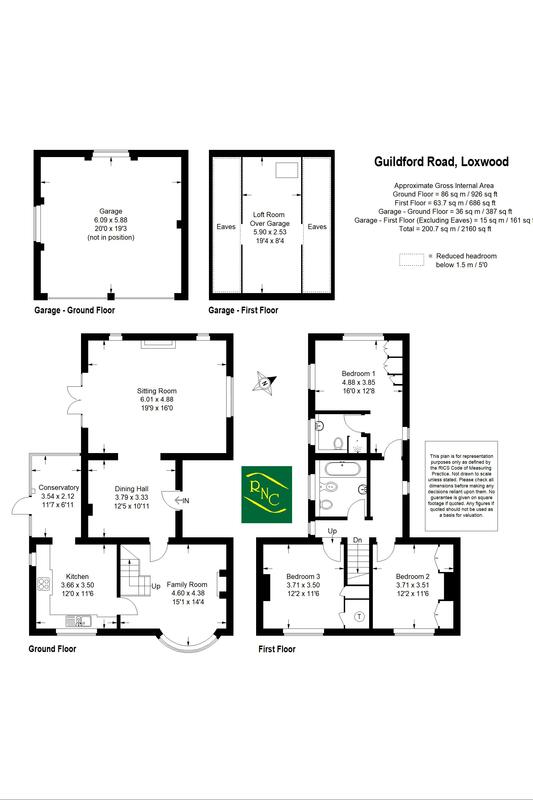 Loxwood is well situated for easy access to the main towns of Guildford, Haslemere and Horsham, also with main line stations. Delightful bright and sunny room, open fireplace set into polished stone hearth and surround with timber mantle over, double glazed french doors to patio and garden. Attractive open fire with polished stone hearth, bay window. Delightful views over the patio and garden, door to back garden. Lovely bright and sunny room, triple aspect with open aspects to the rear, range of fitted wardrobe cupboards. Comprising; tiled shower enclosure with thermostatic shower, concealed cistern WC, vanity unit with wash hand basin and cupboards under, ladder style radiator. Currently used as a home office, wood laminate flooring, storage area, linen cupboard with hot water cylinder and fitted immersion. Comprising; panelled bath with mixer tap, wall hung wash hand basin with mixer tap, bidet, concealed cistern WC, part tiled walls, ladder style radiator. The property is approached via a gravel driveway providing plenty of off road parking leading to a newly constructed detached double garage. There are good size lawns to the front, extending to the side and rear of the property. There is an attractive paved patio retained by low brick walling with steps up to the lawns. Ornamental well with brick surround. Established evergreen hedging form the boundaries providing good degrees of privacy and the rear boundary backs onto open farmland enjoying a westerly aspect. An impressive newly constructed building with electric up and over doors, power and light points. Accessed via pull-down loft ladder.